Suzy became a Dream Maker to share her love of Disney, and to help other families realize their dream vacations can come true! She has helped countless people plan their Disney vacations and other getaways, and has experience in traveling to Disney vacations herself. 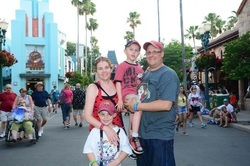 She can offer you insight as a mom and a Disney lover! Suzy can be reached at Suzy@dreammakerstravelagency.com or by filling out a contact form!